L'Agriturismo è situato a Castiglion Fiorentino (Arezzo). Uscita Casello Autostrada A1 Monte S.Savino. Seguire quindi le indicazioni per Castiglion Fiorentino che dista circa 13 km. Arrivati alle pendici del paese, vi immetterete sulla strada principale, svoltando a destra (questa è la strada statale 71 Umbro – Casentinese,che collega Arezzo a Cortona), in direzione Cortona. from Rome (head North)or Florence (head South) using the Highway A1 and take the exit for "Monte San Savino". (You may wish to set your trip meter at this point). After paying the toll charges, at the main road turn right heading for "Castiglion Fiorentino" (SP39). Follow the signs for "Castiglion Fiorentino". At the "T" junction (4.4km), turn left towards "Castiglion Fiorentino". 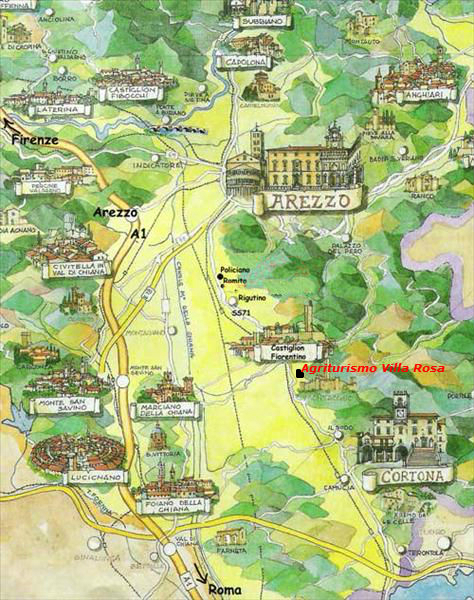 At the traffic lights (5km), go straight on and follow the road towards "Castiglion Fiorentino". After entry to "Castiglion Fiorentino" (14.4kms) at the “T” junction, turn right towards "Cortona". After 1 km you pass a traffic lights and you’ll find on the left “Agriturismo Villa Rosa”.